Some Minnesota farmers are taking steps to reduce the amount of fertilizer reaching state waterways. According to a Minnesota Pollution Control Agency study released in June, farmland is the source for 70 percent of the nitrates in state surface waters. That means state farmers will have to make changes if nitrate pollution is to be reduced, said Dave Wall, an MPCA hydrologist who helped prepare the study. "We're looking at a long-term horizon, of making changes on millions of acres," said Wall. Making changes is important because fertilizer runoff from farm fields in Minnesota and other Midwest states is a major cause of the biological void where the Mississippi River reaches the Gulf of Mexico. The Gulf is expected to have another large "dead zone" when the annual measurement is released later this month. Nitrogen's ability to fuel plant growth is a boon on land, where its presence in fertilizer helps corn grow. But when the nitrogen byproduct nitrate leaves farm fields and enters surface waters, it can be damaging. Nitrate helps promote excessive algae growth, and when the algae die and decompose, the process can deplete the oxygen fish and other marine life need. That's damaging in the Gulf of Mexico, and closer to home. "High levels of nitrate can harm the food chain for fish in our own Minnesota waters," Wall said. Reducing the amount of nitrate that enters rivers and streams is a daunting job, but there are signs that some of the changes made on farms already are taking hold. "Yeah, we've made progress, no question about it," said Gyles Randall, a University of Minnesota soil scientist and professor emeritus. In rows of test corn at the university's Southern Research and Outreach Center in Waseca, Minn., the plants sport different shades of green. The darker the leaves, the more nitrogen fertilizer the corn absorbed. Researchers at the center have determined the smallest dose of fertilizer needed for a successful corn crop, and the best timing for application. But Randall said farmers are only slowly adopting practices the researchers have fine tuned. "We've made more progress scientifically then we have in terms of implementation," Randall said. "Implementation is always two steps afterwards." But some farmers are changing their methods. Among them is Matt Lantz, who farms near Lake Crystal in southern Minnesota. He puts on only as much fertilizer as his crop needs. That reduces the amount of excess nitrates in the soil that can flow into streams. Lantz said sometimes the calculation is as simple as closely watching how fast his corn is growing. "If the crop doesn't need additional, supplemental nitrogen, we're not going to put it on," he said. "We don't want to waste our money if there isn't a need for it." Lantz also uses a product known as an inhibitor that slows the breakdown of fertilizer into a type of nitrate that more easily runs off fields. Research shows that inhibitors can reduce nitrate runoff by as much as 10 percent. State agriculture department figures show sales of inhibitors have tripled in the last four years in Minnesota. Research indicates the inhibitor boosts farm income by keeping nitrates in the soil and improving future harvests. Lantz believes adjusting his fertilizer use not only benefits state waters, but also saves him money. In the end, he said, that economic advantage may be the most powerful reason for farmers to change how they operate. "Farmers that don't embrace this type of technology eventually will not exist, because they can't compete," Lantz said. But there are limits to how much good new farming techniques can accomplish. 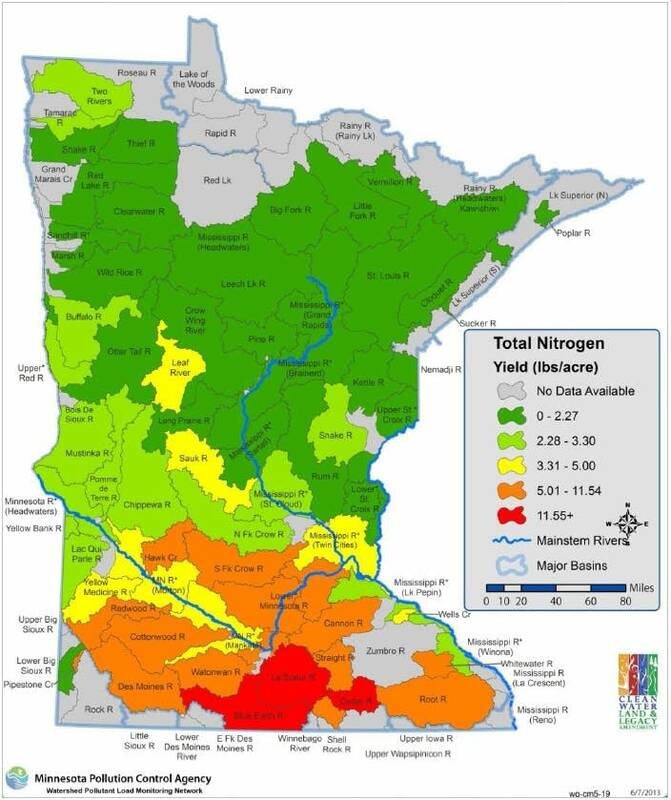 In their June report, MPCA researchers said more efficient fertilizer management potentially can reduce nitrate runoff into state streams about 13 percent. A federal and state task force studying the Gulf of Mexico "dead zone" wants nitrates reduced 45 percent. So while improved fertilizer management will help, it's only a down payment on what needs to be done.